Myopia, also called nearsightedness or shortsightedness, is a refractive defect of the eye in which collimated light produces image focus in front of the retina when accommodation is relaxed. Myopia - What is Myopia? 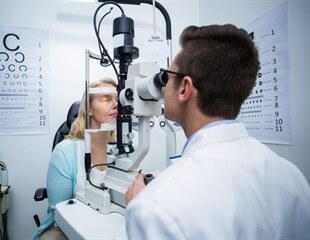 Myopia (nearsightedness) and hyperopia (farsightedness) develop through different molecular pathways, according to a new study publishing October 9 in the open-access journal PLOS Biology by Andrei Tkatchenko of Columbia University and colleagues. An interview with Brendan O'Brien from Vision Direct, discussing everything from the types of contact lenses available to preventing 'dry eye' and the future potential of smart lenses! New four-year study data shows the significant impact of a pioneering contact lens management approach to slowing the progression of myopia (nearsightedness) in children, including those whose treatment begins later. The American Academy of Ophthalmology has provided evidence that they hope will arm parents with knowledge about the rising level of eye strain seen among children who spend too much time on computer screens. As children spend more time tethered to screens, there is increasing concern about potential harm to their visual development. Ophthalmologists – physicians who specialize in medical and surgical eye care – are seeing a marked increase in children with dry eye and eye strain from too much screen time. The results of a study to be presented at the Annual European Congress of Rheumatology suggest childhood and adult obesity increase the risk of developing hip osteoarthritis and knee OA but not hand OA. The international Consortium for Refractive Error and Myopia recently published the worldwide largest genetic study of myopia in Nature Genetics. Researchers from the Gutenberg Health Study at the Medical Center of Johannes Gutenberg University Mainz participated in this study, which identified 161 genetic factors for myopia. It is well known that alcohol intoxication contributes to aggressive behaviors. However, the effects of alcohol on aggression can vary, depending on the person and situation. Three new studies demonstrate research findings that could offer novel treatments for vision and eye conditions. The American Medical Association, the premier national physician organization in the country, voted this week to adopt new policies aimed at improving the health of the nation. The new policies were approved during the voting session of the AMA’s Annual Meeting. Ophthalmologists at Massachusetts Eye and Ear are now offering a new type of minimally-invasive laser vision correction, the ReLEx SMILE procedure. FDA-approved in 2016, and with more than 750,000 procedures performed worldwide each year, SMILE is a proven laser procedure for the treatment of myopia (nearsightedness).